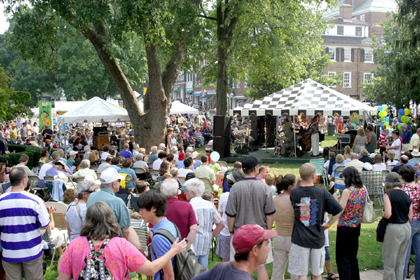 JAZZ ON A SUMMER'S DAY: The music that made New Orleans famous came to Princeton Saturday with Palmer Square's Jazz Feast. Along with performances by the New Legacy Jazz Band, Adam Makowicz, the Junior Mance Group, and the Fins, there was a table for contributions for Katrina relief. Stuart Country Day School sophomore Rebecca Giani Annitto was killed last Wednesday in an automobile accident while on her way home from rowing practice at the Mercer Junior Rowing Club. A proposal for senior housing on Bunn Drive is slated for final review this week, amid strong environmental, architectural, and logistical concerns. Princeton University representatives and Borough residents continued to look for a compromise Monday night as the school sought to increase zoning potential for its engineering quadrangle (E-Quad).